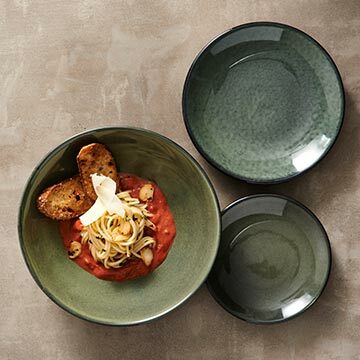 Steelite's Denali Spruce dinnerware pattern will bring a fresh, earthy feel to any table setting. The dark green color is reminiscent of a lush, wooded forest while the blending of planned imperfections with artisan style glazing makes for a unique tabletop presentation. In addition, the hand-crafted glaze application ensures that every item within this pattern will be one of a kind.